IITs and higher education- It is not all about money, honey! The mood at IIT Madras is by and large pensive. Some of the students are agitated and everybody is concerned about their future. The hostel seat rent, gymkhana fee and the medical insurance fee have all gone up. The effective fee hike (tuition + living expenses)for PG students and research scholars comes to 40% and the new B.Tech’s will have to pay Rs. 90K as annual tuition fee in place of Rs. 50K. The increase is applicable to all courses in more or less the same proportions. But there are more reasons for apprehension than a one time fee hike. The officials have categorically told that the hostel seat rent will be further increased in the coming semesters. The Kakodkar committee report titled ‘Taking IITs to Excellence and Greater Relevance’, has proposed to raise the UG fee to the level of Rs. 2.5 lakhs per annum, while there is a lot of ambiguity with respect to the post-graduate fee and support. Further more, the case of economically backward students, which by the way are people who cannot afford to raise approx. 12 lakhs over the four years for an education (that would be more than 95% of Indians), is addressed with wishful thinking, assurances and in my opinion, a dangerous idea of involving banks, loans and debt. 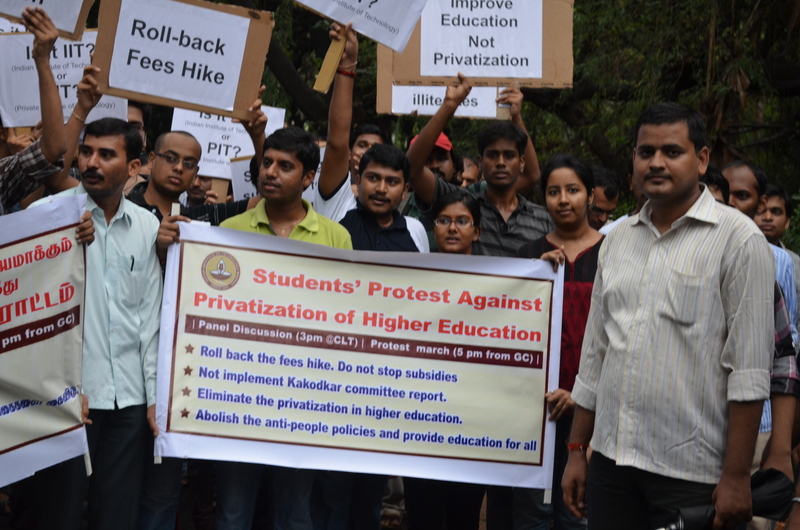 Scenes from the protest march conducted by IITM students against fee-hike and privatization of higher education. A panel discussion on the broader issue of privatization of higher education was held on 6th June, 2013 with Dr. Rahul Sidharthan from IMSc, Chennai, Dr. Venkitesh Artreya, former HoD Economics, Bharatidasan university (also an IIT alumnus from the 64′-69′ batch) and Mr. Jimraj Milton, lawyer and social activist. I was fortunate enough to be the moderator, whose role was limited to explaining the context of the discussion, introducing the speakers and laying down the guidelines for the discussion. Rahul Sidharthan has given a more or less fair summary of the discussion along with his views in his blog. I thank him for initiating such a discussion in the cyber space. Barring a few emotional responses, rhetoric and out of context statements (which were to be expected given that students were very much concerned), it was an open exchange of views. In deed, we need more of such exchanges touching up on various aspects of education (both basic and higher), health, science and technology policy etc. It is especially relevant given that we live at a time when Parliamentary discussions are considered nuisance by the executive and all important policy discussions are imposed without a proper debate. It is a hope against hope to be able to challenge this manufactured consensus. But one has to try. The level of sympathy for IIT students in issues like fee-hikes among the public is quite low. It is understandable given the picture painted about these holy cows, and even justifiable to the extend that many, if not all, get a free ride for their life because of the IIT tag and many among them apparently do not contribute to the society that gave them these riches. This is not a new question either. The term brain drain has been there in vocabulary since a long time. Given the nature of people at large, moving to greener pastures are to be expected in any given system for idealists will always be a small percentage. But one should not confuse between issues here; making IITs self-financed and more dependent on the forces of capital is neither the solution to the problem of so-called brain drain nor going to bring excellence. It is this aspect that I would like to highlight through this post, which hopefully will be one of the many posts to be published about this issue. As often said, houses are more than bricks and mortar, institutions are more than the money invested. If it were, as Dr. Rahul Sidharthan himself pointed out in his blog, private universities must have out smarted any centrally funded Indian universities all of which are pygmies by any international yard stick, by now. The reputation of institutions are built by its faculty, alumni and intellectual contributions. If IITs retain a reputation, however meagre or far from desirable, it is because they are by and large the only technological institutes in the country which have made headway in delivering quality education. If the aim of the Kakodkar committee report was to increase quality, increased fee from students does not make any sense since it will definitely discourage most people from the lower middle class and everyone from the working class. The mushrooming of expensive IIT coaching institutes is definitely an issue that need to be tackled and it is long due by now. This is a major issue both from the point of equity – i.e. only those who are able to afford an expensive coaching is likely to get into IIT – as well as quality – coached students have a better chance to make into IITs, over several naturally intelligent people with good aptitude. But how do we do it- by asking people to pay more? Let us just look at the scenario logically. After such drastic fee-hikes, the people with more than, say, Rs. 10 lakh per annum will still send their wards to those expensive coaching centers. Their business might be affected, but only marginally. The dreamy middle classers will work harder and mostly perish. The ones who go for coaching will face a double jeopardy. Unless the pattern of exams changes drastically so that coaching will hardly help, the people who end up in IITs would have spend as much money on coaching, but the parental income range of the incoming students will have a sharp upward shift. So we will have an exclusive club of elite Indians with very few lower middle class and virtually no one from the working class. It is argued that IIT UG’s come mostly from elite and upper middle class families and now, they will be much more exclusive. Undergraduate education at IIT has a huge market for sure. But I doubt whether the committee or the people who support such astronomical fee-structures in a country where the per-capita income is Rs. 53K (which even by purchasing power parity calculation is less than 1/13 th of USA) have thought about the access to education question. Let us take a comparison between the proposed IIT fee structure and in-state fees charged by much superior state universities in US – University of California, Berkeley & Purdue university. * The value arrived at a conversion rate of Rs. 56 per dollar and considering the fact that PCI of $1219 translates to $3608 in purchasing power parity terms. Note that we have not taken into account the superior quality of education that UCB and Purdue provides. If I just move to the European continent, the picture itself changes drastically. We have countries like Germany where higher education is virtually free. One might argue that many US universities give cross subsidy by charging more up on out-of-state and international students. Even then, the fee as fraction of income level is much lower than the IIT scenario. Thus, even by the capitalist economy standards this is an abnormally excessive fee. Much more than that, the writing on the wall is clear- the elite institution should be exclusively for the elite Indians! Does increasing fee and being “self-sufficient” in operational expenditures help improve quality? Remember, inside the institution we still have the same people doing same things. Attitudes and abilities does not change with source of funding and there is no incentive for the “fee paying” students to demand more since they have already reached what is believed to be the pinnacle of excellence in Indian system. If the argument is that foreign universities will come up with campuses in India and that will create competition, it should be worth while to see how well the satellite campuses of international universities have performed. Most of them thrive only based on the reputation of their main campus- i.e. the value of the brand name and nothing else. There is no incentive to do advanced university research in India primarily because of the lack of a strong industrial R&D, which is not going to emerge any time soon. In every country, fundamental research is mostly funded by the government and unless that funding goes up, we are nowhere in picture. Most importantly, this is not a mere question of money, it is a question of principle. How do we value education? Is it a private good or a public good? While we can and should find ways to avoid free riders, increasing the fee is not the way forward. It is unfortunate that people suggest ‘soft loans’ or ‘super loans’ as solutions. As Prof. Milind Brahme opined during the panel discussion , you are coercing people into a system that most people morally detest. This is not just entrapping future generations of students, but clipping their imagination and creativity for ever. More over, going by the Indian experience, this is just the tip of the iceberg. If government is ready to divorce IITs, the situation in none of the state or centrally funded universities is going to be different in times to come.